Incoterms (International Commercial Terms) 2010 will take effect on January 1st, 2011. This revision addresses the changes in global and domestic trade that have taken place since the last revision, Incoterms 2000. In contrast to the previous 4 classes, E, F, C, and D, Incoterms will now be separated into 2 groups - those applicable to all modes of transport and those applicable only to sea and inland waterway transport. There will now be a total of 11 terms instead of 13, with 2 new additions - DAP and DAT, and 4 deletions - DAF, DDU, DEQ, and DES. DAT: delivered at terminal - NEW! DAP: delivered at place - NEW! 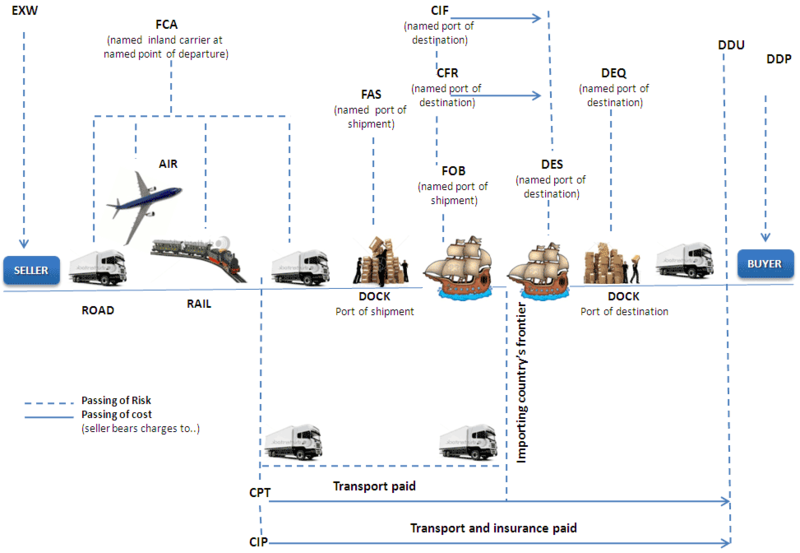 The main purpose of Incoterms is to define the sharing of costs and transfer of risk or damage over the goods, up to an agreed place. This helps in avoiding misunderstanding and disputes among parties. Developed by the International Chamber of Commerce (ICC), ICC Incoterms have become the standard in international business rules setting.